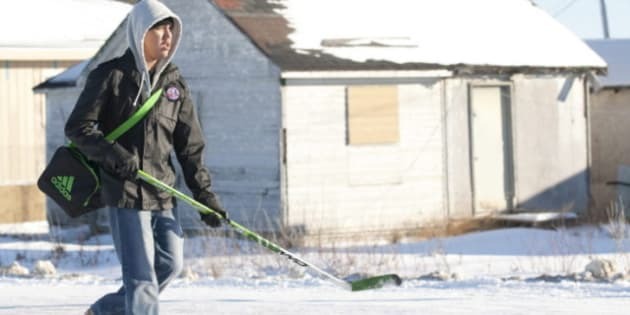 The federal government's response to the crisis in Attawapiskat has been to wrest decision-making from the Chief and Council of the First Nation, placing them under third-party management. But why was this the government's decision? Was it in order to rein in the profligate ways of an errant Chief and council? Was this the intervention that Attawapiskat needed to bring them out of their current crisis? The answer to these questions is a resounding "No." Rather, in order to understand the Harper Government's seemingly callous decision, it needs to be interpreted as part of a much larger strategy. In shaming the leadership of Attawapiskat, in fabricating a crisis over the salaries of Chiefs, and in scrapping the Kelowna Accord, the Harper Government is undermining First Nations both in real terms and in the arena of public perception. First, let's dispel the idea that Attawapiskat required the severe intervention of third-party management. For the past 10 years, the Attawapiskat First Nation has been under co-management. Co-management is put in place when a First Nation has defaulted on the conditions of one of their myriad funding agreements, but is willing to attempt to address the default. The First Nation selects their own co-manager, whose job it is to help them remedy the default, build capacity in the First Nation, and enable them to better manage their funding agreements in the future. This co-manager is given signing authority for the First Nation, meaning no funds can be dispersed without his or her approval. Third-party management, on the other hand, is used in cases where a First Nation is deemed unwilling to address their default, and where there is high risk of default by the Nation in the future. In this case, an outside accountant becomes solely responsible for financial decision-making, accountable only to Ottawa. So, for 10 years, Attawapiskat has had an outside manager -- one they agreed to -- working with them to ensure fiscal accountability. As Chief Theresa Spence has repeatedly stated, her Nation's books are open and available for perusal. They have been audited numerous times, and have never shown any accounting irregularities. Like all First Nations, Attawapiskat's funding is subject to very strict accountability measures, with spending requiring pre-approval by Ottawa. Effectively, First Nations spend a great deal of their time proving to the federal government they have done what they claim to have done with their funding. In fact, Attawapiskat has been meeting these accountability measures, with the help and guidance of their co-manager. In other words, there seems to be no legitimate reason for Attawapiskat to be placed under third-party management. I propose that there exists a deeper method to this seemingly irrational decision, one that has much more to do with political psychology than resolving Attawapiskat's problems. In making this decision, the Harper Government is attempting to amplify the contempt for First Nations bubbling just below the surface in a large segment of the Canadian public. Take for instance last month's reintroduction of Bill C-27, an "Act to enhance the financial accountability and transparency of First Nations." The bill, which was first put forward as a private member's bill during the last Parliament, follows on the heels of the Canadian Taxpayer's Federation (CTF) claims that a number of First Nations Chiefs are paid "more than Prime Minister Harper." The bill would require First Nations leaders to publicize their remuneration both on their own websites and on the website of the Department of Aboriginal Affairs and Northern Development (AANDC). Incidentally, the CTF's claims are based on skewed numbers and problematic comparisons. Here the Harper Government is attempting to fan the flames of resentment for people who already suffer a great deal due to federal mismanagement and a history of colonial violence. Those in the know were baffled by the introduction of the bill, and for good reason. The Assembly of First Nations already publicizes the salaries of Chiefs on their own website, and as they have claimed in response to the CTF and the government, the average First Nation elected official in Canada makes $36,845. Furthermore, the public outrage which informed this bill ignores the fact that the salaries of Chiefs and Councilors are approved by the federal government. Once again, the government seems bent on shaming First Nations, while simultaneously feigning ignorance of decisions that Ottawa has already approved. Placing Attawapiskat under third-party management isn't warranted by the circumstances. However, the move does follow an abstract notion deeply rooted in Canada's colonial history and held by both the current Conservative government and a good chunk of the Canadian public: that First Nations are inherently corrupt and have an insatiable appetite for public money. Why else would the federal government justify third-party management by stating that Attawapiskat has received $90 million over the past five years, even while failing to mention that this money was all duly accounted for? We must be wary of how Harper's decision and the way it has been framed taps into a whole cluster of perceptions: First Nations chronically misspend their finances, they don't pay taxes, they smuggle cigarettes illegally...and did I mention that they don't pay taxes? And even if they aren't overtly corrupt, they certainly aren't capable of actually running their own affairs. We are meant to understand here that Attawapiskat has received what it deserves, not based on any specific wrongdoing of its leadership, but based on who First Nations are: inherently corrupt, or at the very least, incompetent wards of the Canadian state. In responding to the crisis in Attawapiskat -- a crisis that is borne a hundred times over in reserves across the country -- the federal government had a chance to appear benevolent, to respond with generosity, and to claim ignorance to the crisis. If they had taken that route, perhaps everyone would have walked away with political capital intact. But instead, Prime Minister Harper and Minister Duncan chose to shame Attawapiskat's leadership and effectively disenfranchise its citizens by placing an accountant in charge. They have also accused Chief Theresa Spence of lying, announcing that she agreed to third-party management. The very public nature of the decision to place Attawapiskat under third-party management seems part of a larger strategy that includes elements as disparate as the apology to residential school survivors, the disproportionate impact that the new crime legislation will have on Aboriginal peoples, and the scrapping of the Kelowna Accord -- which, incidentally, may have prevented the current crisis through investing $1.6 billion in housing. If we read between the lines, Harper is signaling to Canadians that "we" no longer owe First Nations anything. "They" have taken enough of "our" hard-earned tax dollars already. Such an approach is dangerous in its ignorance of the history behind First Nations destitution. Thankfully, the government's latest manoeuver has partially backfired, with many Canadians beginning to ask rather deep questions about how Ottawa relates to First Nations and the mainstream media persisting in its coverage of Attawapiskat. I hope this can lead to more constructive and respectful relations to enable First Nations to truly flourish as members of the Canadian federation.